The Pemberville Opera House Restoration committee was formed by historical society members interested in the restoration of the Opera House. Fundraisers were held in the form of a melodrama, plays, dessert auctions and generous donations from individuals and organizations. 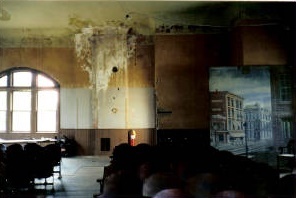 The Restoration Committee met in June and July of 1998 for strategic planning and voted to begin the restoration with the money that had been accumulated to date. The ceiling was insulated and in November two furnaces were in the attic to heat the Opera House. 30,000 feet of wire was used to install a completely new electrical system. 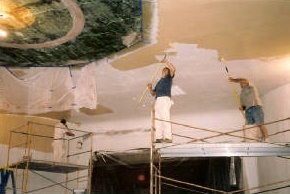 On Jan 17, 1999 restoration work began. 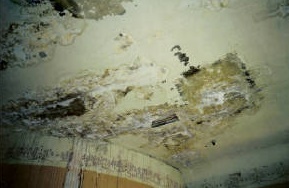 Areas of the walls and ceiling were water-stained and damaged with loose and falling plaster. The floor was covered with 100 years of bat residue. 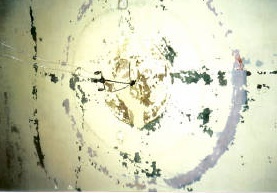 Loose paint was scraped off the walls and ceiling uncovering original stenciling and a ceiling fresco measuring 18 feet in diameter. 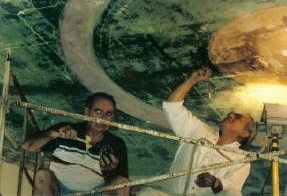 The wall colors and stenciling were duplicated and the fresco was restored using two coats of Rembrandt Oil paint. A total of 457 hours and 7 weeks to complete. One year later a special varnish was applied to preserve the fresco. The heating ducts, electrical, wire, and existing pipes needed to be covered and out of view. The landing at the top of the stairway had to be enlarged to meet code regulations. This was done by constructing walls and creating the coved ceiling to match the existing architecture. Wainscoting was milled to match the existing wall treatment. Plaster was repaired, inside storm windows constructed and the fire escape brought up to code by reinforcing the entire structure and replacing the wooden treads with iron. The floor was vacuumed and scrubbed and years of dirt dug out of the grooves before two coats of polyurethane were applied. There were no pictures available of the original light fixtures or window treatments so extensive research was done to choose chandeliers and draperies appropriate to the late 19th century. The gasolier style chandeliers were purchased, carpet was laid in the foyer and stairway and shutters installed on stairway windows. 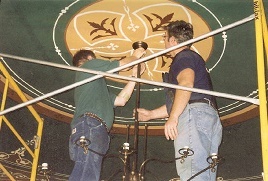 Many volunteers contributed to the restoration of the Pemberville Opera House but there was a core group of people that worked continuously to complete the project in time for the re dedication at the Pemberville Autumnfest on October 23, 1999. One wonders if any of this restoration would have been accomplished without this dedicated core group of committed volunteers. They gave countless hours in what would become a local treasure.